Rammstein (German pronunciation: [ˈʀamʃtaɪ̯n]) is a German Neue Deutsche Härte band from Berlin, formed in 1994. 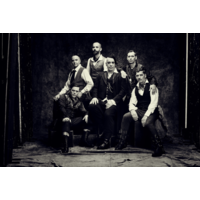 The band consists of members Till Lindemann (lead vocals), Richard Z. Kruspe (lead guitar and backing vocals), Paul H. Landers (rhythm guitar, backing vocals), Oliver "Ollie" Riedel (bass guitar), Christoph "Doom" Schneider (drums and electronic percussion) and Christian "Flake" Lorenz (keyboards). They are widely accepted as part of the Neue Deutsche Härte scene, alongside bands such as Oomph!, Eisbrecher, and Die Krupps. Their songs are usually in German, but they have also performed songs entirely or partially in other languages such as English, Spanish, French and Russian. As of 2009, they have sold over 15 million records worldwide. Rammstein's entire catalogue is published by Universal Music Group. Since their formation in 1994, Rammstein has had no changes in their band line-up nor have any members left the band. They have become known worldwide for their extravagant live shows,amazing pyrotechnics and other effects. The pyrotechnics are the worlds best and the lead singer checks them all himself before the shows begin. Rammstein takes their name indirectly from the German town of Ramstein-Miesenbach, the site of the flight show disaster on 28 August 1988. The band's signature song, "Rammstein", is a commemoration of the disaster. In a short period before the band became well known, they performed using the name "Rammstein-Flugschau" (literally meaning "Rammstein-Flightshow").